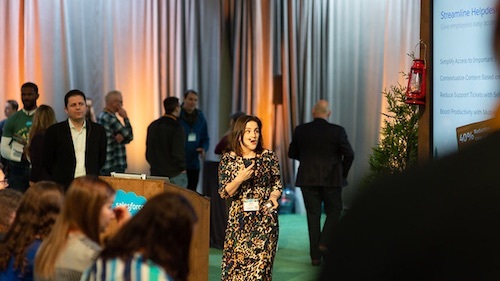 Every year since 2003, Trailblazers from all over the world have gathered together at Dreamforce for four fun-filled days of career transformation, innovation, giving back, and relationship building at the largest software conference in the world. And every year, Chairman and CEO Marc Benioff shares Salesforce’s vision for the future and announces key innovations to our Customer Success Platform. 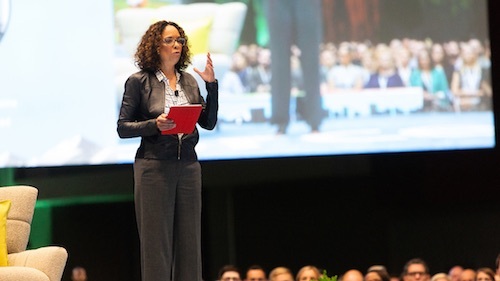 This year’s keynote was no exception, bringing inspiration, entertainment, and education to the packed Dreamforce campus and to the millions who tuned in online. Read on for the must-see, can’t miss highlights. After a traditional Hawaiian blessing and hula dance to open the show, Marc took the stage to begin his much-anticipated keynote. Throughout his hour and a half up on stage, Marc (and his stylin’ kicks from adidas) kept coming back to one main theme: Everyone has the power to be a Trailblazer and make the world a better place. Who are these Trailblazers, exactly? They’re developers, administrators, sales leaders, marketers, and CEOs. They’re customer innovators, technology disruptors, and global shapers. Trailblazers are people like Stephanie Herrera, who founded ATX Girly Geeks and created Salesforce Saturday, a community gathering to learn Salesforce. After a short film featuring Stephanie’s inspiring story, Marc introduced her and the Salesforce Ohana (the Hawaiian word for family) recognized her for her achievements. Every Trailblazer has a unique story, but they all share the same traits of striving to be their best selves — and helping others along the way. As the keynote progressed, Marc pointed out that Salesforce’s growth and success stems from our strong ecosystem of customers, partners, and employees. 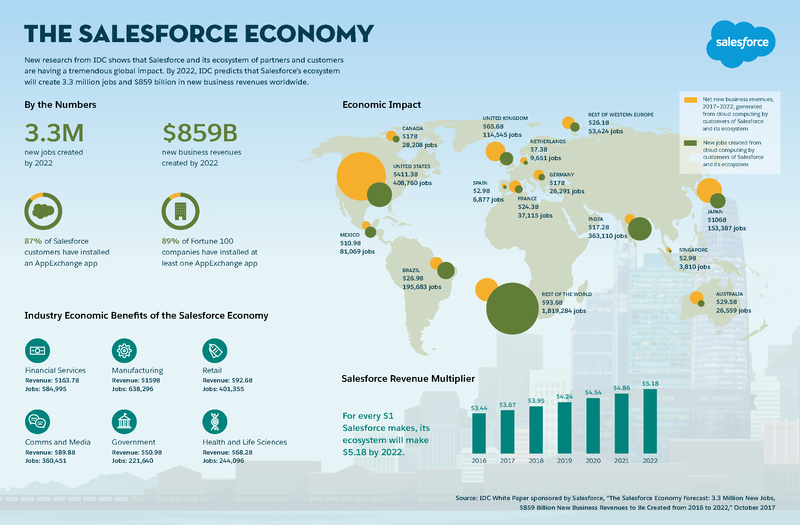 Together, our Ohana has created an incredible Salesforce Economy — one that will drive the creation of 3.3 million new jobs and more than $859 billion in new business revenues worldwide by 2022. Together, we are doing well and doing good. Salesforce’s unique business model, with our core values, commitment to equality, and philanthropy model, prove that businesses can be a meaningful platform for change while spurring huge growth. To see a full-size version of the infographic, click below. More products are being enhanced by data and intelligence. Companies must undergo a digital transformation to adapt to these shifts. Behind the 4IR are savvy, connected, always-on customers, and they expect seamless experiences from every company they engage with. Marc related a sentiment that made an impression on him during his travels to meet with customers and rehearse this keynote: many people feel scared or uncertain about the changes the 4IR brings. Instead of feeling more connected with their customers, some businesses are feeling increasingly out of touch. At the same time, every day he meets allies who are rising to 4IR challenges and connecting with customers in new ways: Trailblazers. It will be Trailblazers who drive customer success in the Fourth Industrial Revolution, and Salesforce aims to empower people with new skills and technologies needed to thrive in this new era. All of these customizations help you build around your customer — from no code to low code — on the world’s #1 Platform-as-a-Service. In a final surprise announcement, Marc revealed a new global strategic partnership with Google to deliver smarter, more collaborative experiences for customers. 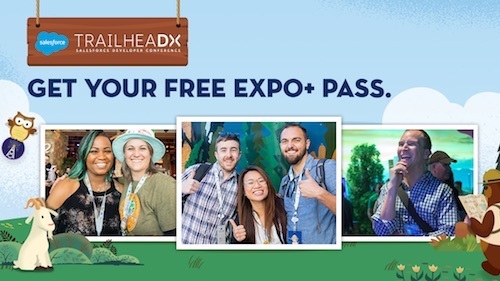 This partnership will deliver new integrations that connect Salesforce with Google Analytics 360 and G Suite. Discover what’s new with the Salesforce and Google partnership here. 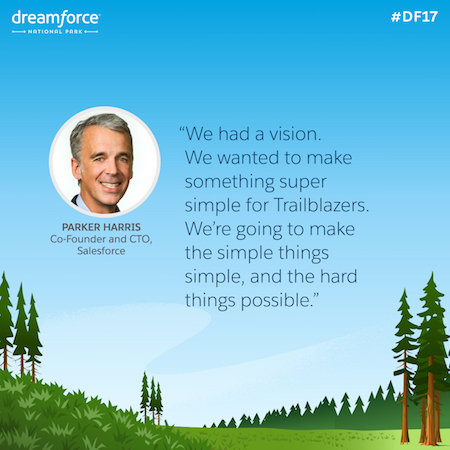 Dreamforce ‘17 is just getting started — it’s only day one, so stay tuned for hundreds more exciting can’t miss moments to come, and check out Salesforce LIVE for more real-time, on-the-ground coverage. Want the full rundown of Marc Benioff’s Dreamforce ‘17 keynote? 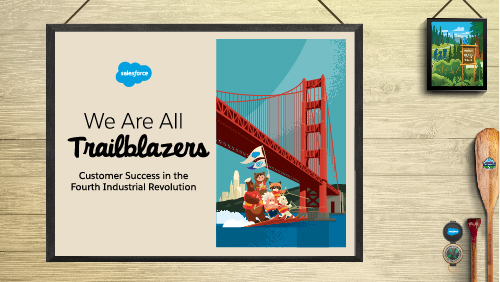 Get the We Are All Trailblazers e-book and dive in.